An article published by various Spanish news outlets (La Vanguardia, El País, El Diario) has recently (re)sparked the attention of my Spanish philologist friends, since it has popped up in my newsfeed for the third time this year. The article itself was originally published in early 2014, yet evidently is still being circulated and shared today. Given that most news tends to be forgotten shortly after publication, one must question why this particular article has survived expiration and continues to (re)generate interest within Spanish circles. No doubt, the article’s seemingly cyclical reapparition is due to its highly problematic and controversial content. 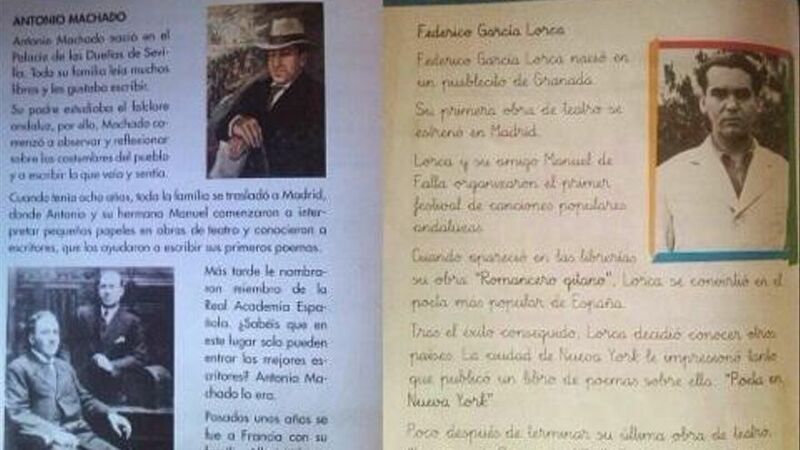 The article addresses a Spanish primary school language and literature textbook targeted towards 6-year-old students, criticising the euphemistic representation of the circumstances which led to the unfortunate deaths of the Spanish poets Federico García Lorca and Antonio Machado. Federico García Lorca was a Spanish poet, playwright, and a member of the literary movement Generación del 27. At the beginning of the Spanish Civil War in 1936, Lorca was executed by the Francoist regime, and controversially, his body has yet to be found. The exact motives for his assassination are still unclear, although it is suspected that he was executed for his sexual orientation, and/or his socialist views. Antonio Machado was also a Spanish poet and a prominent figure of the Generación del 98. In 1938, due to circumstances imposed by the dictatorship, Machado and his family were exiled to Barcelona across the border to the French town of Collioure, where Machado died shortly after. Taking into account how these authors died, it is interesting to see how this particular textbook reflects (or not) this information. In regards to Machado’s death, the primary school textbook assures: ‘After a few years, he went to France with his family. He lived there until he died’ . Concerning the assassination of Lorca, the textbook reads: ‘Shortly after finishing his last theatrical piece ‘La casa de Bernarda Alba’, Federico died, near his hometown, during the war in Spain’ . In the case of Lorca’s death, the textbook entirely neglects the fact that he was assassinated by the fascist State, but instead vaguely mentions that he died during the war. What war is the textbook alluding to? How did Lorca die? Explicit reference to the Spanish Civil War is euphemised in favour of the more politically neutral and vague term ‘guerra en España’ (war in Spain). The textbook also omits other important information such as the fact that his remains have yet to be found; his homosexuality, and that he opposed the dictatorship. The biography of Machado is similar in comparison, as any allusion to his exile is absent. In fact, it is merely described as ‘he went to France with his family’. The textbook neglects accountability of the Francoist regime, and is instead worded as if Machado’s exile was voluntary and apolitical. Taking into account the real circumstances under which these poets died, the explosively negative reception of this textbook content on social media is evident. Although these textbook statements are not factually incorrect, they are omitting important, sensitive, and relevant information in regards to the political motivations that led to not only the deaths of these poets, but those of thousands of people. It is therefore not surprising that the publishing house (Anaya) ultimately decided to retract the textbook and sell a newly revised edition. However, according to El País, internal sources of Anaya have defended the textbook’s content by claiming that ‘a 6-year-old pupil does not understand what exile is, this is why not much detail is given. The teacher, if needed, can give more information’ . It is uncertain whether this is a case of innocently vague euphemisms, as an attempt to avoid exploring politically complex issues to such young students, or as part of a more sinister attempt to distort the historical reality presented to students, which itself forms part of a much wider historical and global tradition of textbook manipulation. Either way, the content of this textbook and the weak justifications provided by the editorial are unsatisfactory, to say the least. This entry was posted in Andrew Bradley and tagged Francoism, Generación del 27, Generación del 98, Lorca, Machado, publishing house, Spain, Spanish Civil War, Spanish history, textbooks. Bookmark the permalink. When did the textbook originally come out, Andrew – in 2014? If so, that’s all the more shocking. I was also wondering if the publishing house is known to be right-leaning? Many thanks for your comment Nina! Textbooks in Spain tend to stay in circulation for up to 4 years. This is for many reasons but I would argue that profit margins is much to do with it. However, it is not rare for a textbook to be used for more than 4 years, particularly if nothing needs to be updated. Based on what Anaya has said, it would not surprise me if the textbook were still to be in circulation today if it were not for the social media backlash. It shows a lot that they do not really understand what is wrong with the textbook content if they are saying that ‘teachers and parents have not complained before’. That is not really a justification! If I find anything I will let you know!